Consider avoiding travel to Texas, Kansas and Nebraska during the Spring. 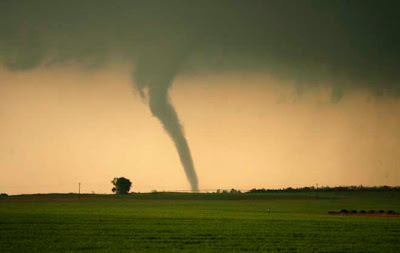 Although this is a gorgeous time of year, it is also the time for tornadoes. I can personally attest to the fact that May is a particularly bad month for tornado activity in Nebraska. My family and I spent many a May evening huddled into our basement, after hearing the tornado warning sirens alerting the community of impending danger. Should you find yourself in the path of a tornado, for God's sake take shelter! It is best to go into a basement, finding a room that does not have a window. If there is not a basement to be found in your building, then move to the ground floor and find a closet or possibly a bathroom without a window. If it is the bathroom that is your only choice climb into the bathtub and pray that the tornado does not find its way to your door. They say that if you are in a car and you spot a tornado you should get out of the car and lay flat in a ditch. To be honest with you, my reaction in this situation would be to drive away from the tornado as fast as I could. Obviously, this is not sound advice as it could lead to a terrible road mishap and I would hate to think that I have caused you to act in error. Interested in storm chasing? You must be mad, but I admire your bravery (or stupidity). Apparently there are many Storm Chasing Holidays on offer in the states, but I will not list them here as I would hate to be an advocate of bad decision making. For the complete story on the recent weather events of the region, follow this link.